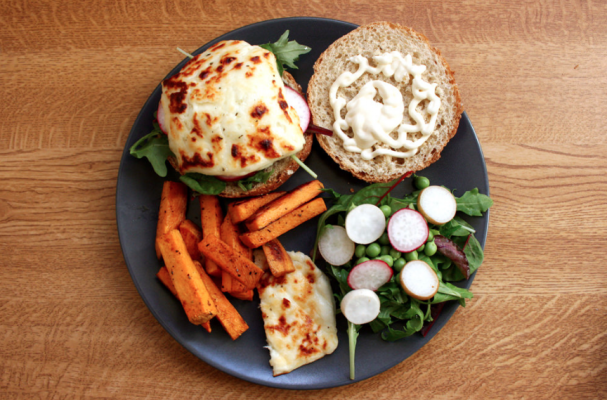 Black Bean Halloumi Burgers with Spiced Sweet Potato Wedges is a new way to enjoy the favorite burger and fries combination in a healthier way. This homemade meal will soon become a family favorite because it its packed with flavor and insanely easy to prepare. Black bean patties are studded with vegetables and creole spices and baked until crisp. Instead of American or cheddar cheese, I went for sliced halloumi cheese which adds a nice salty bite. You can purchase halloumi at Middle Eastern markets or specialty foods stores. In keeping with the spiced theme, the sweet potato wedges are tossed with cumin. The smokiness balances perfectly with this sweet root vegetable. Step 1: Preheat your oven to 425 degrees F. Spray two baking sheets lightly with the nonstick spray and set aside. Step 2: Add the carrot to a bowl with a little water, cover it and microwave for about two minutes. Once cooled, mash them and add them to the mashed black beans. Mix together then add the remaining vegetables and mix well. Step 3: Add the oatmeal, breadcrumbs, seasoning and salsa. Mix together until combined. Add the flour and mix well. If the mixture is too moist, add more flour and adjust the seasoning, as needed. Step 4: Form the mixture into patties and place them on the baking sheets. Bake for about 20 minutes, flipping them halfway through cooking. Just before removing the patties, place a slice of cheese and continue cooking for a minute or two until the halloumi has melted. Step 5: Prepare the sweet potato wedges at the same time so they can cook together. In a large bowl, add the sweet potato wedges and toss with olive oil until all pieces are evenly coated. In a small bowl combine the sugar, salt, pepper and cumin and mix until well combined. Add the spice mixture and toss again. Spread the wedges onto a baking tray, taking care not to overlap the wedges. Bake at 425 degrees Fahrenheit for approximately 20 minutes or until tender and crisp. Step 6: Assemble the burgers by placing on a bun and adding your favorite toppings and condiments.